During PMA Nikon announced another new Coolpix member; the Coolpix 5200. This easy-to-operate digital camera delivers high 5.1 Megapixel quality and a selection of useful functions. The newly developed 3x optical Zoom-Nikkor lens with a focal range of 7.8 to 23.4mm (equivalent to a 38-114mm lens in 35mm format) assures high image quality. Its newly developed compact lens ensures optimal clarity through the use of a glass ED element and aspherical elements. Featuring aspherical elements and an ED glass element, it achieves a significant reduction in aberration. It has also been specially designed to retract to an extent that complements the camera's slim design. The camera also features the same stylish grip design as the other cameras in the popular Coolpix range, has satisfyingly compact dimensions, and a light weight, factors that combine to make the camera feel naturally comfortable in the hand. Furthermore, all controls are conveniently located within easy reach on the back of the camera body. This enables highly intuitive operation in general and provides easy access to the camera's 15 Scene modes. Each of these modes adds simplicity for the shooting of a different kind of subject, while four of them offer a Scene Assist function to make shooting even easier still. Just like the Coolpix 4200 this new model camera incorporates automated reduction of the "red-eye" effect, a highly-demanded feature which Nikon is pleased to be able to offer purchasers of this camera. Advanced Red-eye Reduction is fully integrated into the Nikon image processing system within the camera and once enabled operates without the need for any user intervention. The Coolpix 5200 achieves rapid power-up and swift, precise autofocus, which allows photo opportunities to be seized at any time. It also offers high-speed continuous shooting too, allowing the user to capture fast action as it happens. Additionally, the Coolpix 5200 has an easy-to-see GUI, which allows the user to select desired settings and functions in minimal time, with minimal effort. White balance offers a choice of Automatic, Preset and 7 Manual modes. What's more, it divides the shooting area into segments to determine the most appropriate setting for the capture of faithful colours. There's even a white balance bracketing function too, which takes a series of three shots at different white balance settings with just a single press of the shutter release button. High-quality TV-size movies with sound can be recorded at the smooth rate of 30 frames per second, allowing the user to show results to friends or family in a much more practical manner. For storage convenience at any time, the Coolpix 5200 is additionally equipped with approximately 12MB of internal memory, allowing the storage of a substantial number of shots without the need for an SD memory card. As a result of its high-level specifications, the Coolpix 5200 achieves prints that can be enlarged all the way up to A4 size while still retaining an admirable level of quality. Printing can also be done without the need for a PC by simply connecting the Coolpix 5200 to a PictBridge-compatible printer via the included USB cable. The Coolpix 5200 even offers versatility in terms of power source, with compatibility with both Li-ion rechargeable batteries and lithium disposable batteries also. All recorded movies and images can be automatically imported into the included Nikon PictureProject software, which opens up a whole new range of possibilities for the digital photographer. Enabling organization, editing, and design capabilities for images in a unified, user-friendly interface, this exciting new software from Nikon will also allow the addition of new features as the market evolves. 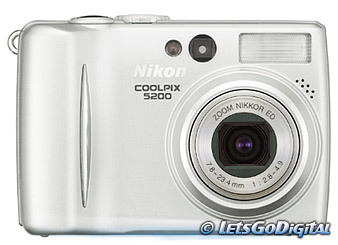 Nikon Corporation will launch the Coolpix 5200 worldwide from May 2004.